Welcome to Missouri River Regional Library! This library dates back to 1898 when through the “active interest of a number of spirited citizens formed to create a free public circulating library” (News Tribune June 28, 1931). By 1901, two prominent Jefferson City residents decided to approach Andrew Carnegie in hopes of securing a monetary gift to build a library. Mr. Carnegie agreed and donated $25,000 for a new library building. The terms of Mr. Carnegie’s gift required the town to furnish a site for the structure and agree to pay $3,000 to annually support it. The original library site on 210 Adams was completed and dedicated on December 23, 1902. Our current building at 214 Adams was completed in 1974 and dedicated in the spring of 1975. What began as a collection of 1,700 books has grown into a collection containing more than 250,000 items! 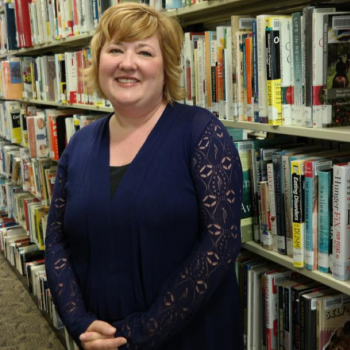 Over a century later, Missouri River Regional Library is alive, well and serving the Cole and Osage County communities. I have had the good fortune to work here for over 19 years, watching the library evolve to meet the information needs of an ever-changing world. Our library still provides all the traditional services one expects to find in a library, yet we have fully embraced the digital age. We extend our reach beyond these walls with not only our eBooks and databases, but also with our bookmobile and outreach services. Working in libraries as long as I have, has strengthened my belief in the transformative power of libraries, and their potential to reach people regardless of age. Throughout the span of one’s life, the library is there. Whether it is serving an early literacy role in the life of a child, a place to use a computer, participate in a book discussion, meet an author, or learn a new life skill, the library is relevant to each stage of life.